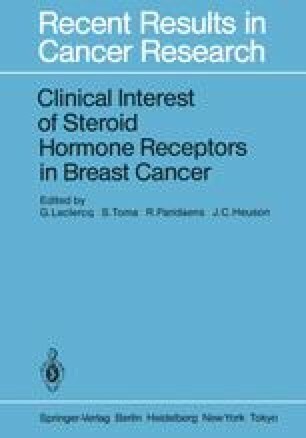 In 1977 a quality control program for steroid receptors, performed in breast cancer tissues, was initiated in The Netherlands. Presently 18 laboratories are participating in this program. During the first three trials lyophilized tissue powders were used as reference samples, because this type of preparation showed no loss of receptor binding when stored for at least 3 months at 4° C and for several weeks at room temperature . Recently, the usefulness of lyophilized samples for daily control of steroid receptor assays within laboratories and for comparison and standardization of measurements between laboratories has been reviewed . In the first trials of this quality control program large variations in receptor values between laboratories were observed, although the participants agreed on the classification of the reference samples as estradiol receptor (ER) positive . The tissue powders used in those trials contained intermediate or high receptor values. These variations in reported results were ascribed to the variety of methodological techniques employed by the participants, including the use of several different protein assays . These methodological factors caused laboratories to score rather consistently high or low on the various reference samples. In assessing these results, it was noted that variation in protein values could be minimized if all laboratories used the same type of protein assay in addition to the same protein standard. Therefore all participants agreed to measure the protein content of the cytosol by the method of Bradford , using Kabi human albumin as a protein standard. In addition it was decided to analyze lyophilized reference cytosols in the forthcoming trials in order to eliminate interlaboratory differences in the preparation of the cytosol and to permit easier delineation and standardization of the most important steps involved in the receptor binding assay itself.